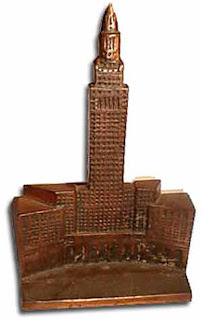 A variety of souvenir buildings of the Terminal Tower have been produced over the years including paper weights, bookends, pen holders and wooden models. The Terminal Tower bookends are cast iron and stand just over 8 inches tall and a set recently sold on ebay for $255. Reader Scott D. sent me this great link about miniature models of the Terminal Tower. Some of these models were hand-made by fans of the skyscraper. Earlier, I wrote about topics which included Terminal Tower versions including souvenirs with pens and buildings with forced perspective. The real Terminal Tower is a landmark skyscraper located on Public Square in downtown Cleveland, Ohio. It was built during the skyscraper boom of the 1920s and 1930s, and was once the second-tallest building in the world. Originally built to serve as an office building atop the city's rail station, Union Terminal, the the Beaux-Arts structure rises 52-floors with a height of 708 ft. and rests on 280 foot caissons. Designed by the firm of Graham, Anderson, Probst & White and opened in 1928. Like the Empire State building, the observation deck was originally intended to be used by Goodyear for future dirigible travel between Cleveland and New York City. The deck was planned to be the terminal, but docking was ruled unfeasible so it was used as an overlook and tourist attraction. On a clear day, visitors can see 30 miles from downtown Cleveland. Now called the Tower City Center, the real structure houses offices, rapid transit stations, 100 shops, six restaurants, a movie theater, amphitheater, fitness center and two hotels. 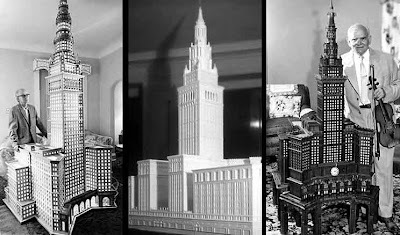 Have you seen other souvenir building versions of the Terminal Tower?